I get dizzy sometimes going through Instagram by getting sucked into the beauty vortex of videos. So many products so many reviews its hard to keep up. Lately, I’ve been noticing an influx of beauty gadgets and tools. Some are just ridiculous and I can’t even imagine how it even works. I wondered if everyone else is feeling the same. Now I know there is no miracle tool that works 100% and is right for everyone, but there are some options that can really help your skin and makeup application. I went on a little quest and bought a few gadgets and tried them myself. I have rounded up a few items that I personally loved and I promise will not break the bank! This has to be one of my all time favorite gadgets it is a little spatula that fits in even the littlest bottles to scrape out the bottom and sides of remaining product that we normally can not get out. There have been times that I have tried getting it out by using a q tip and it ends up in a total disaster or the q tip end up absorbing the product, and a total waste of time. This little tool does the trick! No more wasting product. Sooo… the face massager has gotten quite a few giggles from my girlfriend, but I assured her and everyone that it is indeed for your face. Aside from making us giggle, this little tool helps increase blood circulation to the face, leaving it feeling smooth and plump. I like using it to decrease puffiness and use it when applying night or day cream to help with absorption. The jade roller has the same benefits without the vibration, but you can put it in the freezer overnight and it will be super refreshing and help with puffiness around the eyes. They claim that both these products reduce wrinkles, I haven’t seen that benefit from it yet, but they are great for reviving your skin and prepping it for makeup. If you use foundation, this little sponge will be your best friend. It creates a smooth even finish without streaks and helps minimize product waste. Moisten it before applying to make it super soft and help with the application. It can also be used with powder I use it to set my under eye concealer. It just really gives you a natural look! Pro Tip: dunk it in some water and nuke it for a bit to clean it up. 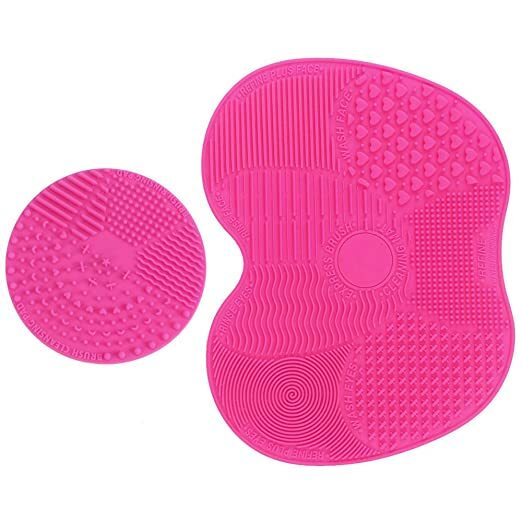 These mats are so great with helping get out all the yucky built up makeup off your brushes. This particular one has suction cups that grip to the bottom of your sink to avoid it from siding all over the place. Cleaning your brushes often not only helps with their longevity it also helps colors stay true when applied, no muddy uneven streakiness. And of course, it keeps them from accumulating bacteria and germs. Pro Tip: After washing your brushes make sure you dry them with the handles up and the bristles down so that any access water runs off of them and does not sit inside, it can rot out your handle, loosen the glue, make them smell funky and ultimately ruin them. I know I said these products won’t break the bank but I wanted to add one last thing, it is a little bit of a splurge, but it is totally worth it without a doubt. I like to save these little treats as suggestions for my husband to get me as a Birthday, Christmas, or Valentine’s gift, and occasionally I just start up my own little “fund” for it. These guys come in a few different sizes and price range, they can start around $40 (Foreo Luna Play) going as high as $199. I have tried the electronic brushes before and I wasn’t impressed. I love how this more hygienic and it shows better results by far. It has multiple speed settings so you can customize it to your comfort level. This works as an exfoliating machine, to put it simply. It wipes away 99.5% of oil, dirt and makeup residue while exfoliating your skin with pulses. Its made of durable soft silicone so its easy to clean and you don’t have to replace brush heads ever. That’s about it! These are just examples of things that I use and liked, maybe there are other versions of these items that work for you or something else that is completely new. I would love to hear about what you liked or have tried, or something I should try myself.